As Benjamin Graham stated in the Intelligent Investor; "The extreme depth of the depression of the early 1930's was accounted for in good part, this writer believes, by the insane height of the preceding stock-market boom." It is easy to see the full cycle using the 1930's stock market as an example. During the Roaring 1920's stocks were bid up to 32 times earnings. This bubble ensured the Great Depression. Eventually, stocks fell 75%+ becoming cheap at 5 times earnings. Those that bought at these rock-bottom levels established or ensured their wealth for generations. We agree with Graham. Investment losses are created by the high valuations of the preceding mania. Likewise, profits are found in great deals. Market outcomes are not random. The overvaluation of the stock market in the year 2000 (43 times earnings, greater than the Great Depression) is directly responsible for the last decade+ of no return. This shouldn't have been a surprise to investors. So what are stocks waiting for to become truly dirt cheap? "In the 1930s, interest rates moved down, up, and then down again, in three distinct phases: In Phase 1, all interest rates declined due to deflation. 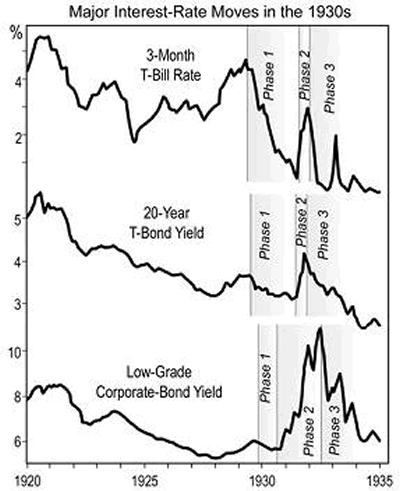 In Phase 2 , however, despite sharp GDP declines, interest rates surged unexpectedly : The 3-month Treasury-bill rate jumped six fold - from about a half percent to 3 percent; the yields on 20-Year Treasury bonds surged beyond their pre-crash peak; and the average yield on low-grade corporate bonds exploded higher to 11 percent. At this juncture, like today, the federal government came under increasingly intense pressure from creditors to reduce its federal deficit; limit its efforts to save failing banks; and, shift to a more disciplined, austere, tough-love approach . Finally, in Phase 3, interest rates fell and mostly remained low for the balance of the decade. As we stated in Bond Market Casualties of the Double Dip; "We expect rates to go up due to default risk and not because the economy or inflation picks up." Anyone aware of the U.S. government's fiscal situation would agree. As Dr. Marc Faber recently stated, "in a global recession, what will also happen is that tax revenues will collapse and the fiscal deficit will go ballistic. And so the quality of government paper will deteriorate." So we reiterate our call: "We expect all bonds to lose value, even Treasury Bonds." So let's say there's no "unusually unfavorable economic and market conditions" over the next few years and ignore the Depression comparisons. Bonds are still a terrible investment. UK yields are the lowest (i.e. prices at their highest) since the Bank of England began recording them in 1703. U.S. ten year yields are also at record lows. If rates just return to where they have existed in the previous few centuries, bonds will lose money. If you are a bondholder you have to realize you've been given a once-in-300-year gift. But don't push your luck. What happens when a government bond market goes kaboom? All we have to do is take a look at Greece. However with a caveat; the U.S. may only receive some of what Greece is enduring. For instance, we may experience soaring interest rates but no default. Stock markets in the U.S. may not go down 90% as they have done in Athens. Prices for hotels, restaurants and taxis may not go down 50%. Small businesses "may not be finished." And political centers and urban areas may not become totally uninhabitable due to strife in the streets. Although, George Soros expects they will and history also suggests that they will. We don't know how much 'Greece' we are going to get. But we should expect falling stock and bond prices, large financial losses, and a severe credit crunch. Those holding the least risky securities will be holding what the global financial system needs to survive and will thus be protected. Remember the market is challenging the government's borrowing ability, so relying on bailouts funded by borrowing is not a sound policy. We can only rely on the demand from market participants to provide support for security prices. At Lamont Trading Advisors, we provide wealth preservation strategies for our clients. For more information, contact us . Our monthly Investment Analysis Report requires a subscription fee of $40 a month. Current subscribers are allowed to freely distribute this report with proper attribution. Copyright © 2012 Lamont Trading Advisors, Inc. Paul J. Lamont is President of Lamont Trading Advisors, Inc., a registered investment advisor in the State of Alabama . Persons in states outside of Alabama should be aware that we are relying on de minimis contact rules within their respective home state. For more information about our firm, or to receive a copy of our disclosure form ADV, please email us at advrequest@ltadvisors.net, or call (256) 850-4161. Ben Graham was Warren Buffett's professor and mentor, and the original proponent of Value Investing. Buffett calls Graham his second greatest influence after his own father, and even named his son after Graham.